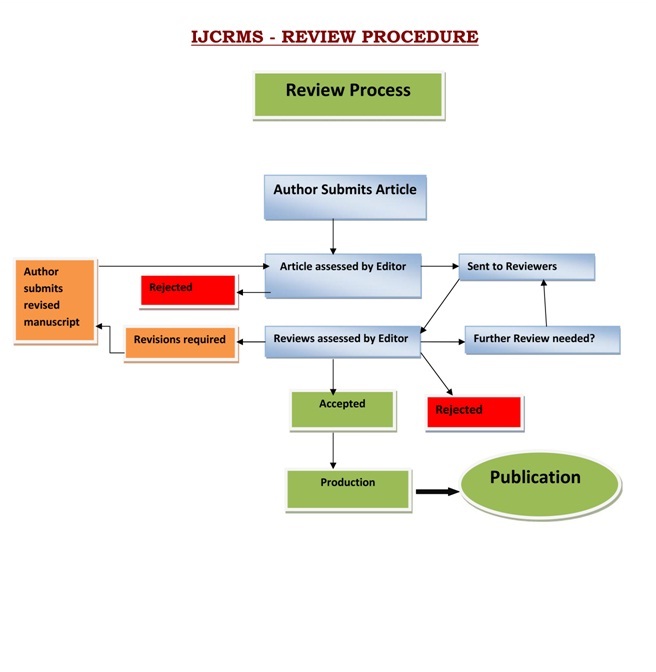 International Journal of Current Research in Medical Sciences (IJCRMS)[ISSN: 2454-5716] publishes research articles, Reviews, Case reports and short communications. It is important that authors prepare their manuscripts according to established specifications. The authors are strongly encouraged to read instructions carefully before preparing a research manuscript for submission and publication in our journal. The manuscripts should be checked carefully for grammatical errors. All Research articles are subjected to peer review. It should be describe a new and carefully confirmed findings, and experimental procedures should be given in sufficient detail for others to verify the work. A Short Communication is suitable for recording the results of complete small investigations. Short communications are 2 to 4 printed pages in length. The IJCRMS journal employs the double-blind peer review process, where both reviewers and authors remain anonymous throughout the review process. Every proposal submitted for publication is read at least by an editor, for an initial review. If the paper agrees with editorial policies and with a minimum quality level, is sent to another reviewers. The reviewers won't know the author's identity, as any identifying information will be stripped from the document before review. Introduction: It should be provide a clear statement of the problem, the relevant literature on the subject. It should be understandable to colleagues from a broad range of scientific disciplines. Materials and methods: It should be complete enough to allow experiments to be reproduced. However, only truly new procedures should be described in detail; previously published procedures should be cited, and important modifications of published procedures should be mentioned briefly. Subheadings should be used. Results: should be presented with clarity and precision. The results should be written in the past tense. Previously published findings should be written in the present tense. Legends should be typed in numerical order on a separate sheet. Graphics should be prepared using Microsoft Word manuscript file. Tables should be prepared in Microsoft Word. Shirin Sultana (2014), (Ahlam F. Hamoda et al., 2014), (Samer Punathil, 2014), (Stock and Kanbour, 1975), (Saygil , 2006; Walsh, 1987a,b; Doulay, 1993, 1995). Brener PF. Diferential diagnosis of abnormal uterine bleding.1996. Am. J. Obstet Gynecol. 175 (3 Pt 2):76–769. Badhy, S. C., Amin, K. M. R., Kabir, S. M. L., Paul, B. K. and Das, S. K. 2003. Broders pneumonia: histopathological changes in the lungs of broiler chickens. Int. J. Bio.Res. 1(1): 5-58. Henri J. Vial , A. 2006. Gorenflot Chemotherapy against babesiosis Veter. Parasitol. 138: 147-160. Witner, M,Rowin, K.S,Tanowitz, H. B,Hobs J.F., Ssltzman, S,and Wenz, B .1982. Successful chemotherapy of transfusion babesiosis .An. Intern .Med.96:601- 4. Hilt, B.R, and Cuningham, C.J. 2000. Torsional properties of stainles stel and NiTi files after multiple autoclave sterlization,J. Endodont.26:76- 80. Mitchel, B.F ,James, G.A and Nelson, R.C .1983.The effect of autoclave sterilzation on endodontic files. Oral Surg .Oral Med. Oral Pathol. 5: 204-207. Yusuf, S, Wites, J and Friedman L. 1980. An overview of results of randomised clinical trials in heart disease. I. Treatments following myocardial infarction. J Am Med Asoc. 260(14): 208-93. Pop, R.L, Wolfe, S.B, Hirata T, and Feigenbaum, H. 1969. Estimation of right and left ventricular size by ultrasound: A study of the echoes from the interventricular septum. Amer. J. Cardiol 24: 523. Corya, B.C, Rasmusen, S, Knoebel, S.B, and Feigenbaum, H. 1975. Echocardiography in acute myocardial infarction. Am. J. Cardiol .36: 1. Short Communications are (1) Abstracts are limited to 100 words; (2) instead of a separate Materials and Methods section, experimental procedures may be incorporated into Figure Legends and Table footnotes; (3) Results and Discussion should be combined into a single section. Authors are required to pay Rs. 5000 for Indian Authors and 150U$ for foreign authors towards as processing fee. The corresponding author may still request (at the time of article submission) to the editorial board office waive some of the processing fee under special circumstances. If Author wish to cancel the publication with us after completing Final Submission / After Publication, As per Terms and Conditions of International Journal of Current Research in Medical Sciences (IJCRMS) which Author has accepted during Initial Submission and Final Submission and also in duly signed Author Declaration Form, Fee once deposited will not be refunded. Author is already given ample time to consider publishing with us or not before making Final Submission. Journal performs all the process promptly and on time for which it has to pay the cost too. Author may withdraw the paper and International Journal of Current Research in Medical Sciences (IJCRMS) will have no objection if said withdrawn article is published somewhere else.